Bread + Butter is a new bakery and café on the outskirts of the North End. Its owner is Lee Napoli of ChocoLee Chocolate in the South End. 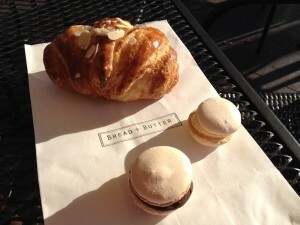 I stopped in for an afternoon snack of an almond croissant ($4) and 2 macaroons (lemon and chocolate). The croissant was flaky and tender, but the marzipan filling was in a big clump, instead of evenly spread through the pastry. I really miss Café Cakes in Watertown – they had the best almond croissants I’ve ever had (including my trip to Paris). The macaroons were excellent. The lemon was perfectly tart and the chocolate filling was deeply cocoa flavored. The texture was perfect. $1.25 a cookie is steep, but it is worth it. I enjoyed my goodies sitting on their patio outside. It overlooks the Greenway – perfect for watching the tourists strolling by on a sunny autumn afternoon. I have read their sandwiches are delicious as well – it seems like a great additional to the North End.